We were very excited to work with the ladies from 'Open the Book' to retell the story from the Old Testament about Noah and his Ark. Class Sweden enjoyed their visit from Father Ossie. He told us a little bit about his life and some of the many jobs he has to in our Parish. 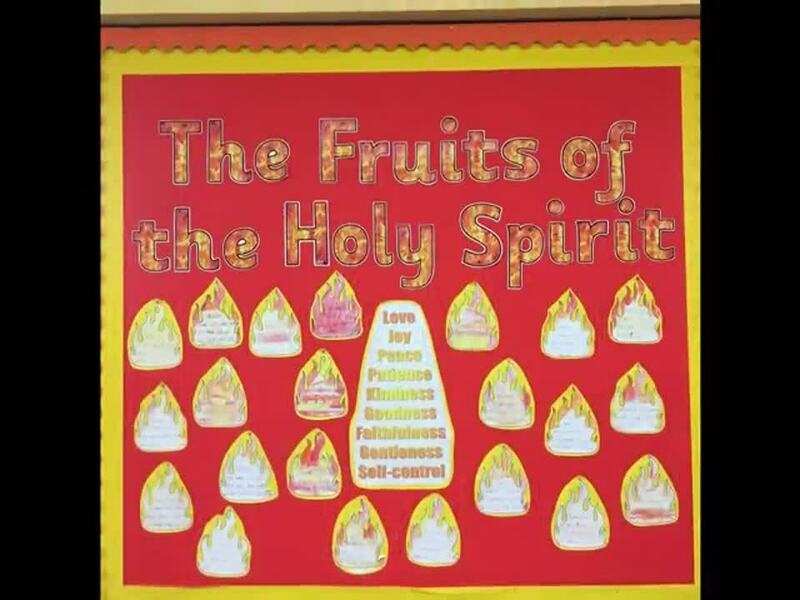 Today at Our Lady's we have been learning about the 7 mercies for our termly R.E day. We split into our house groups and each group took part in a different activity relating to one of the 7 divine mercies. Above, is a piece of artwork to represent 'bury the dead' which we linked to the resurrection story. Some more artwork to represent Jesus' ascension to heaven! We spent the afternoon in our house groups, going round each class with sessions focusing on Gospel Values. In Class 1, we learnt about Love and Family, in Class 2, we learnt about Service and Faith, in Class 3 we learnt about Justice and Hope and in Class 4, we learn about Truth, Compassion and Forgiveness. We finished the day with Prayer and Liturgy in the hall, and then we invited parents and parishoners for tea and cake after school to tell them what we had been learning. We all had a fantastic afternoon. We were honoured when Bishop Micahel Campbell, Bishop of Lancaster, visited our school on 8th June. He took part in our morning Prayer and Liturgy and blessed all of the children and staff. Bishop Michael confirmed twenty-six young people from the Parish of Sts. Mary and Margaret on Sunday 7th June. It was a wonderful occasion and a great celebration for the whole community. We regularly use social media, such as Twitter and Facebook, to share our achievements and celebrations with the wider world. We are always excited when we are retweeted by the diocese or other important people! You can learn more about our diocese here. To mark our Deanery's Vocation focus day, each class made a poster to be displayed in church. Nine children from Class Three celebrated receiving the sacrament of the Eucharist for the first time on Sunday 14th May. It was a beautiful day celebrated by the whole parish community. To mark 'The Year for Consecrated Life' we held a Vocations Day in school. The children were put into mixed age house groups and moved around each class over the course of the day, completing activities relating to Vocations. The day ended with a Prayer and Liturgy devoted to service and consecrated life. On 1st May, we took part in the national RNLI welly day. We raised money for the lifeboats and learned about the vital service in our area. In the run up to the General Election, children in Key Stage Two spent an afternoon finding out about the political parties who were taking part in the election. The researched and produced posters giving information about each party. They then had to present their findings to staff and try to convivnce them who to vote for. This tied in with our work on British Values, looking at democracy. Children in Reception writing the sentence 'He is Risen' during their RE lesson. Edith in Class 1 made this cross with her mum during our Parent Activity afternoon. Her mum tweeted us this photograph of it proudly displayed in their window at home. Our School Choir performing in the Hymn Singing category on stage at the Coronation Hall on 26th March 2015. While we were at our Forest Schools session, we took some time to quietly meditate and appreciate God's beautiful world. Thanks to Cath Pearson and Sandra White for our very informative CAFOD assembly. We held a toy swap to raise funds and awareness for the UNICEF Day for Change. We researched how UNICEF helps children who live in very difficult circumstances. We said prayers and thanked God for all of the blessings we have in our own lives. We held our Nativity, 'Angel Express' in church on 11th December. Our families and parish community joined us. The children sang and performed brilliantly. Well done everyone! The choir sang at the St. Mary's Hospice 'Light up a Life' service on 8th December 2014. The service is an opportunity for the families of people who have spent time in the hospice, to remember them and celebrate their lives. Each person remembered was represented by a special light on the Christmas tree. To mark the feast of Christ the King and International Youth Sunday, each class made a poster to display in church. On 21st November 2014, Bishop Michael celebrated a mass to officially amalgamate the parishes of St. Mary of Furness, Ulverston and Our Lady of the Rosary and St. Margaret of Scotland, Dalton in Furness. As the schools in both parishes are already federated it was a chance for us to celebrate our joining with our sister parish. The new parish is know as the parish of Sts. Mary and Margaret. We had a party in the social centre afterwards with a beautiful cake made by one of our talented parishoners. We raised money for BBC Children in Need in November by coming to school with 'mad hair'. Some of us put in lots of effort with our creative hairstyles! Canon Flannery celebrated mass in school to mark the end of another school year. He presented each of the Year 6's moving on to secondary school with a bible to mark their time at St. Mary's. Mrs Roberts, a long serving teacher from St. Bernard's (she taught Mr McGoldrick and Mrs Jaggers) retired in July 2014. We attended the mass celebrating her contribution to Catholic education along with children from other local Catholic schools. As part of our topic in the infants, we were learning about new life and growth. Mrs Rielly brought her chickens in from home. We were all filled with awe and wonder. They were wonderful! We loved having the opportunity to share the fantastic features of our school with the local community by taking part in the annual Ulverston Carnival on 5th July 2014. It was so much fun! Alice's Escapes was founded in April 2012 by (then) 16 year old Alice Pyne from Ulverston. Alice's vision was to enable every sick child to enjoy a holiday with their family - an escape where they could be looked after from start to finish and simply enjoy being together. A group of children from our school were invited to visit the Alice's Escapes caravans in July 2014 and prepare them for the families with terminally ill children who would be arriving that weekend. They cleaned the caravans, changed the beds, chose gifts for the families and checked that everything was perfect for their arrival. We worked with Alice's mum Vicky and her sister Milly. It was a very emotional experience but we learnt so much about this fantastic local charity and it made us determined to help them to raise more funds for them. On 27th June 2014, we had a 'Dress up and Dance Day' in aid of Macmillan Cancer Support. We raised £185 and had lots of fun in the process! Our annual Parish Gala took place on 8th June 2014. Lots of football and netball teams from across the Furness area competed. There were a large range of stalls and activities for all the family. We raised over £1600. Well done everyone! Six children from Class Three celebrated their First Holy Communion on 11th May 2014. They enjoyed a celebration with members of our school and parish community in the social centre afterwards. Class 2 re-enacted the story of Moses when learning about it int RE. Canon Flannery helped us to celebrate the beginning of the new term with a mass in school. The theme of the mass was Discipleship and we all refelcted on ways that we could be better disciples. We were joined by lots of members of our families and parish community for the celebration. Each term, Mr McGoldrick holds a parent activity afternoon for Reception. This is usually tied in with an aspect of the liturgical year. We have a very active choir. Each year they compete in the South Cumbria Musical Festival. One of the categories that they are always successful in is the Hymn Singing. In April 2014, the choir were awarded the Ulverston Town Council award and bursary. We were very proud and the money was spent on buying some new spiritual music for the choir to work on in the future. Centrepoint is the UK's leading charity for homeless young people, supporting 16-25 years olds with housing, learning, health and life skills. Our School Council wanted to do something to help so they organised and ran a bring and buy sale to raise money for them. We managed to raise over £100. Well done everyone! As part of World Autism Day, we all came to school dressed in our Onesies! We raised money for the charity and Mrs Fox did a special assembly all about how challenging life can be for children living with autism. We learnt lots and developed more understanding of how to help people in our school and local community, who live with autism. We were featured in the local paper for our fundraising for 'Alice's Escapes', and the National Brain Cancer Association. We wore purple as that was Alice's favourite colour before she passed away earlier this year. Every month, we have a Parish Youth Mass. Pupils, past pupils, staff and parents all contribute to the music and liturgy for the mass. Gilbert is very excited about playing at today's mass! Our whole school went to church to receive ashes for Ash Wednesday. The ashes mark the beginning of Lent and our desire to be closer to God in our preparation for Easter. Cath Pearson and Sandra White came to tell us all about the work of CAFOD in the run up to Lent. We all thought of a Lenten promise that we could make which would help other people. We will be collecting money for CAFOD throughout Lent in school. Canon Flannery celebrated mass in school to mark the beginning of the new term. The theme of the mass was new beginnings and fresh starts. Lots of members of our parish community attended to celebrate with us. Our School Nativity took place at church on 12th December 2013. It was a wonderful occasion for our whole parish community. Our Superhero Day raised £185.60 for the BBC Children in Need. We all had a great time and raised money for a good cause. Well done everyone!